Last week I had the opportunity to address a group of ambassadors to the UN Headquarters in Geneva. The topic of discussion was the current practice and potential of digital diplomacy at the embassy level. Following my presentation, the ambassadors asked me what are followers of digital diplomacy channels looking for? Why have they decided to follow embassies, missions and foreign ministries on twitter? After thinking on the matter for a few second I replied that such followers have great expectations from diplomatic institutions that are active on twitter or Facebook. This is due to the fact that the governments of the world, which these ambassadors represent, have invaded the online world which until recently was in the hands of private users. Continuous Engagement- Engagement is the raison d’etre of social networks. When people post a Selfie online they expect their friends to comment, share or like this self-portrait. 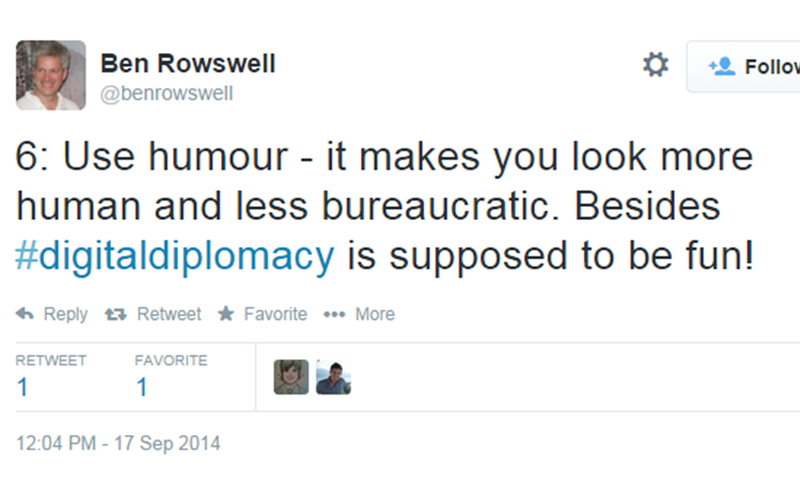 This also true for comments posted by online followers of diplomatic institutions. I have often written in this blog that engagement also represents the fundamental difference between digital diplomacy and traditional public diplomacy as it enables governments and their institutions to create meaningful relationships with followers. However, most MFAs, embassies and ambassadors use twitter more like a radio than a social network as they broadcast information at followers rather than speak with Perhaps the finest example of how engagement can transform the practice of diplomacy came last week when Canada’s foreign minister answered a question posed to him by an online follower. 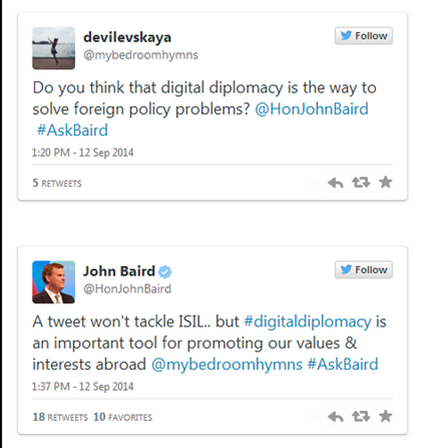 By using 140 characters, the minister beautifully articulated what digital diplomacy can and can’t do (see below). Transparent Diplomacy­- The Arab Spring of 2011 had an immense influence on social networks. By using Facebook and twitter to organize the Arab World’s greatest democratic awakening, Arab users were able to associate social networks with the values of democracy, free speech and transparent government. And while diplomacy will never fully be transparent, the amount of information currently accessible to twitter followers of diplomatic institutions is truly remarkable. For instance, by following diplomats assembled at the Geneva 2 convention, followers of digital diplomacy knew which delegations were in the convention room, what was being said by each government representative and even which resolutions to the Syrian conflict were “on the table”. 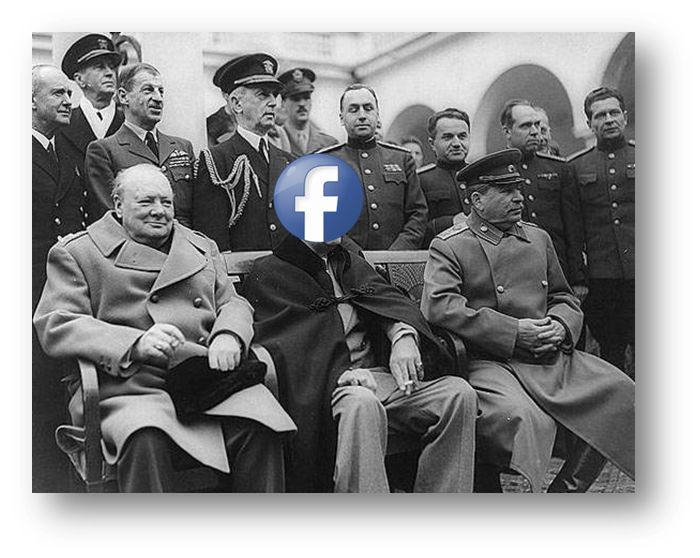 Compare this with the amount of information available to citizens interested in the Yalta Conference of 1945 and you begin to realize how digital diplomacy is transforming one of the world’s oldest professions. And in that spirit, below is a video posted by Israel’s former President Shimon Peres who is currently job hunting. Information Not Twipoganda- Finally, diplomatic institutions should realize that their online followers are not only tech savvy, they are also knowledgeable about world events and current affairs. They flock to accounts operated by embassies and foreign ministries out of a desire to better understand occurrences shaping our world. Thus, they have the ability to differentiate between information and propaganda (or Twipoganda in the age of twitter) and once they detect propaganda they soon leave without returning. Posted in Uncategorized and tagged Digital Diplomacy, diplomacy, Facebook, great expectations, twiplomacy, Twitter. Bookmark the permalink. This site is known as a walk-via for all of the information you wished about this and didn’t know who to ask.